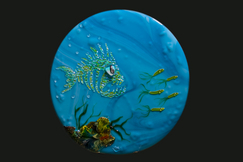 "Rene and Chuck have excellently creative work that has original designs that truly separate them from other glass artists. Our friend Heather had a tattoo done using our art, from the angry fish series. Thanks Heather what a compliment!